Mark Warburton has confirmed doubts over whether star attacker Josh Windass will be fit in time for Sunday’s crunch clash at Pittodrie. The attacking midfielder has impressed since his sparkling display at Parkhead and his contribution has become increasingly important to Rangers, but the 22-year old suffered a possible hamstring pull during the pre-match warm up against Queen of the South at Ibrox, and had to be replaced last-minute by Croatian playmaker Niko Kranjcar. 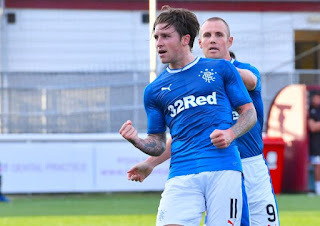 His absence would be something of a blow going into a tough match like Sunday’s first meeting with Aberdeen in four years, with his creativity and running such useful tools for Rangers to have and hopefully he will be fully available for the test. That's why he was playing for AS. Constant hamstring injuries hampering the boys career. I just hope we have every one to pick from in the semi that is coming up we need to beat Septic. I reckon our front 3 and midfield 3 will be the same as against the QoS. Expect Foderingham to come in for Gilks, and Wallace to come in for (sadly) Hodson. Josh, Barrie and Crooks to come on as subs.